Get 2019 off to a fantastic and memorable start, join us for our New Year Day parkrun. PLEASE NOTE: Many of our volunteers would like to the opportunity to do a parkrun too and want to travel to Wendover for a 10:30 start. So we will be starting VERY promptly and aiming for a quick finish and fast get away. We expect a very good turnout. Although we hope that the Hastoe Lane carpark will be open we cannot 100% count on that and you should not park on Hastoe Lane itself. Also please avoid parking on the narrow residential streets close to the Park. Instead we ask that you arrive several minutes early and park in the town, or walk, jog, bike........just avoid Hastoe lane, please. 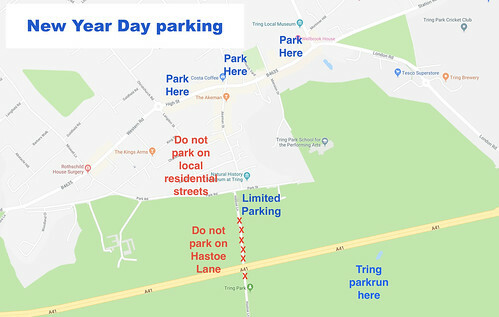 Click on the map below for more detail on parking on our NYD Day parking arrangements. Thinking of "doing the double" on foot? 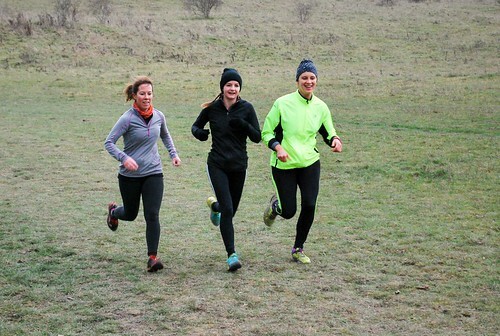 Wendover parkrun is only just over 5km from Tring Park and many have expressed an interest in running there rather than driving. Click on the map below to go to information on how to do this. 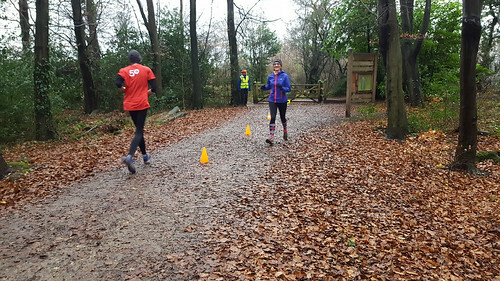 271 parkrunners and 21 volunteers will remember our last Tring parkrun of 2018 for many reasons. 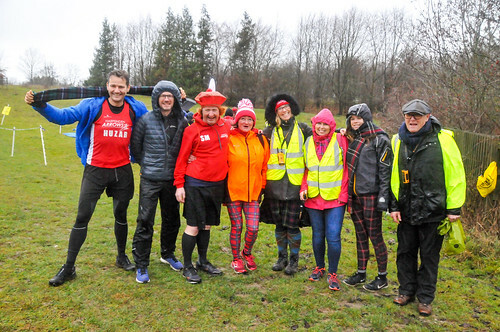 Rob FIRTH, Sammy HADDOCK, Sarah ANNETTS, Peter KEMP, Rachel HURST, Clifford HURST, and Charles ASHWELL might well remember their very first parkrun. Perhaps one of the 14 "parkrun tourists" visiting Tring for the very first time (and hopefully not the last!) will remember that experience. 31 may well remember recording a brilliant Personal Best time. And Kirsty DANCE, Sarah WADE and Greg LEFF might well be pleased to have bagged the last three milestone runs - each completing their 50th - of the year. For many, though, it will be that weekend it took a day and a half to get their official results! 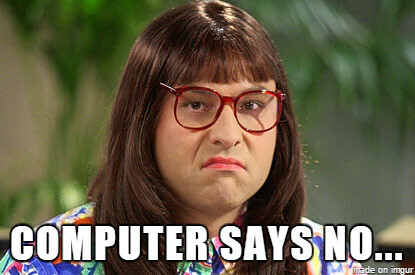 We have a dedicated "Tring parkrun computer" (a bit like old Batman films when everything, no matter how obvious, has a label, ours actually has "Tring parkrun computer" printed on it) and it said "No". 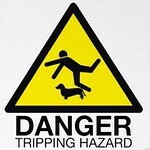 To be more exact it said "hold on; hold on; errrr Ok now; no sorry maybe not; yes alright; hmmmm; definitely NO!" and wasted a lot of time. So we got another computer and loaded new results processing software. However the software for reading the Timers needed a password and that took time too. We already knew that the two stopwatches didn't quite match (this happens from time to time, and is why we have 2!) and so sorted that. We were also aware that token numbers didn't match the the number recorded on the stopwatches. There are many reasons for this - missing tokens, tokens sticking and also the dreaded "funnel duckers" and "double crossers". (No, I'm not making this up - Google it - it's one of the biggest causes of results issues and was a huge problem at the recent Bushy Christmas parkrun). Funnel Ducker: "Crosses the finish line and doesn't take a finish token". If you cross the finish line you must take a finish token to keep the timings right, all you have do is give it to a person scanning or the Run Director. Double Crosser: "This person runs through the finish line more than once, it is usually someone who has run back to encourage another runner to the finish". The timer will have given you another time, and so if you do this you must take a second token and go to the Run Director or the barcode scanners and let them know and we can remove the extra time position. Double crossing funnel duckers: "A double crosser who then funnel ducks". Let's not go there! To finalise the results we resorted to photographs (which, of course, this week were not taken on the finish line and so needed some interpretation) and pieced together other bits of evidence with known finish times to reach a conclusion. When I say "we" I mean "Andy Evans"
A side effect of all the above is that Andy hasn't had time to turn the pedals on his stat-o-matic contraption. So we'll skip that for this run write-up. Also we've delayed our (mostly complete) "review of the year", which we were going to share with you today, until next week now. A lot went on in 2018 an this will be worth waiting for. However I'll share one important factoid. Whoever crosses the line 36th on January 1st 2019 will be the 40,000th person to do so at Tring parkrun - a milestone no one can ever repeat! I guess we should say a few words about the actual parkrun! It was one of those mornings where if you were in the wind it was chilly but otherwise felt quite mild. It was also reasonably dry underfoot and that combination helped many book a PB result. A quick scan through the results shows that Claire ASHWELL and Tom MANTLE both managed a PB at the first attempt (i.e. on their second run) and Chris BAKER and Martin DONNELLY both booked a second PB on their 3rd runs. I also spotted that William Knight made it 3 PBs in a row at Tring...in 3 different years (and, therefore, three different versions of the course!). I did have several people raise the point of runners not keeping to the left of the path when passing those coming in the opposite direction. We had more than one case where young children and dogs veered into the path of other runners and we're keen to avoid an accident. Your help in this will be much appreciated, and please help us remind those who will not see this message, or hear the RDs briefing. Congratulations to Kirsty, Sarah and Daniel on their brilliant 50th parkruns. That's it for this week's write up. 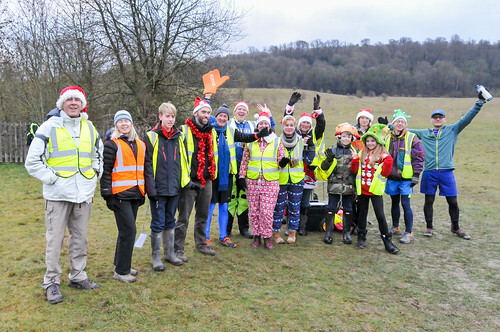 Thank you for making 2018 a wonderful year of parkruns at Tring Park. Hopefully we will see you tomorrow (the 1st) - in any case we wish you all a very happy new year. 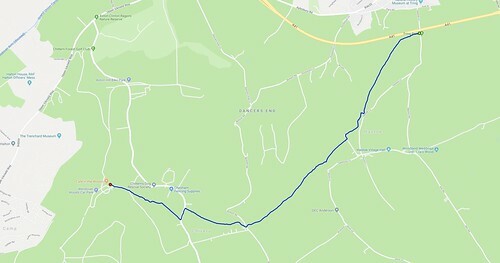 It is roughly 5.5km from the corner of Tring Park (near the A41 bridge over Hastoe Lane) to the start of Wendover Wood parkrun, and involves over 160m of climb. The following is just one possible route - and we don't guarantee that you will not get lost! Keep an eye on the posts on our Facebook page for others who are considering this and team up. If you've not run in this part of the world before we do not recommend trying this on your own and/or for a first time. 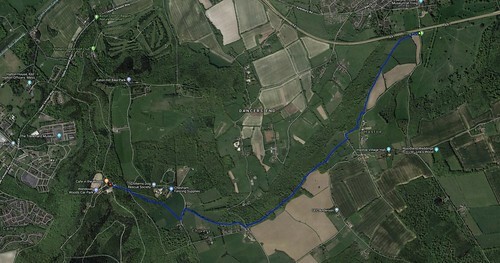 Below is a link to a GPX file for the above trail - based on a recce by Andy Collings. UNFORTUNATELY the parkrun system disables the "download" option and so when you click on the attached instead of downloading the GPX file it opens it. You could save it and rename it, but depending on what browser and system you are using this may be tricky. The GPX file is here!. What a fantastic, festive turn-out for Christmas morning, it was great to see so many Santas, Elfs and smiling faces. We even got a mention in the Boxing Day edition of the Guardian. Event Director Andy Evans was interviewed and you can see that in the article called "On the first day of Twixtmas my true love said to me...". Enjoy. What a brilliant festive atmosphere in Tring Park on Christmas morning. "I'd been looking forward to being RD this year as I usually have to work on Christmas Day and it was definitely worth it to see so many smiling happy faces in the park. 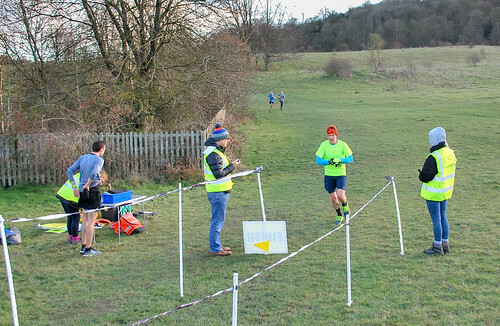 I'd like to pass my special congratulations not just to those with PBs and milestones but to Oliver GREENSTEIN on his first time 'winning' a parkrun (I know, it's not a race) and in doing so he becomes the 72nd fastest person to ever run at Tring. A special mention goes to Stuart MIDDLETON who turned up at 0919, 15 mins after the pack had sent off and as well as having to run an extra 300m to get from the finish where he met us to the start line he then managed to chase down and overtake the tail walkers to get into the results and finish in 41:32 (an aggregate time of under 25 minutes taking in the extra distance)". Now onto the run write-up, brought to us this week by our very own Chris Nicholls. 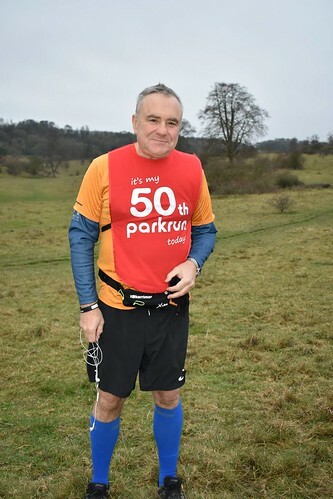 Chris celebrated his 100th parkrun at Tring on Christmas Day and below he also reflects on what parkrun means to him. Well said Chris and thank you. 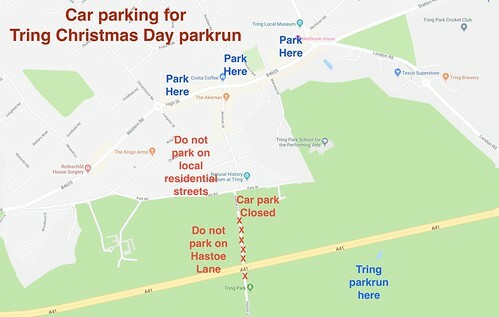 Father Christmas gave us the gift of an extra Tring Parkrun this year. 310 people decided to earn the right to their Christmas feast by running, jogging and walking around the 5K winter course. That's our 4th ever largest attendance, highest in the period September to December and the highest for our temporary winter route. 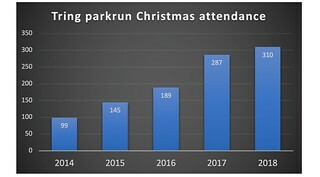 The growth in Christmas Day parkrun attendance at Tring. Robin ATTFIELD, Louise BLADEN, Steve BLADEN, Isobel BLADEN, Elizabeth DANIEL, Ken DOUGLAS, Sophie EVANS, Sam EVANS, Andy EVANS, Ann-Marie EVANS, Hannah EVANS, George FLETCHER, James FOSKETT, Matthew FOSKETT, Paul HEMBURY, Trevor LARK, Chris MILLAR, Richard MURPHY, Chris NICHOLLS, Tom NORTH, Helen PAGE, Thomas PAGE, James PAGE, Matty SINFIELD, Ella VAN DE LINDE and Allison WILLIMENT. Just some of santas/parkruns little helpers this week. If you have not tried it yet then have a go at volunteering. There are lots of roles available with some (like the pre-event setup or doing the run report) allowing you to still run. Also, if you volunteer 25 times you get a smart purple T-shirt. We were joined by 23 very welcome visitors from other parkruns and also 9 first time ever parkrunners. To them I would say remember a parkrun is for life not just for Christmas (i.e. keep coming down). Oliver GREENSTEIN was the quickest back with a PB time of 18.58. Looking at his previous two runs at Tring (25/12/17 and 01/01/18) he may have another crack at a PB on the 01/01/19. I am assuming that Samuel GREENSTEIN is Oliver's brother who was the fastest junior back with a PB time of 19.53 (and also the 4th fastest ever time for the JM11-14 age category). Oliver GREENSTEIN was our festive first finisher! Fastest lady back was Jenny MADDOCKS with a PB time of 22.40. 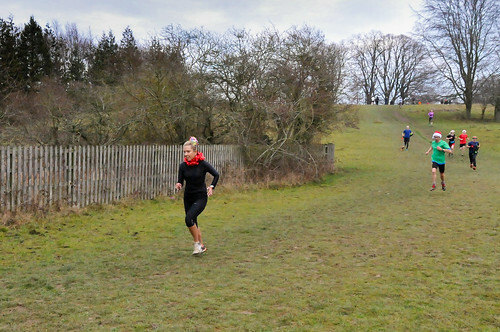 Jenny has completed an impressive 297 Parkruns mainly in the Cathedral City of St. Albans. In total there were 29 PBs set on Christmas day, including 2 PBs in 2 weeks for Amelie BUNN and Charlotte BAILEY. Well done to you all. Jenny MADDOCKS was our female, festive, first finisher! Fantastic! We also had more T-shirt milestones than in any week so far at Tring - a total of 12! Congratulations to Daniel NEWMAN, Robert WILLIAMS, Debbie BOWEN, Sue FERGUSON, Abigail MULLEN, Lee ROBINSON, Samantha HOLLIER and Lucy WADE for joining the 50 club. Congratulations also to Holly and Elaine BUNN, Harriett (Claire) HARMAN and also to me Chris NICHOLLS (not sure if black is my colour) for joining the 100 club. Harriett also brought the biggest 100 cake ever - thank you. To the 27 people who perhaps forgot their bar codes can I suggest a late Christmas present of a barcode wrist strap, plastic card or plastic tag? 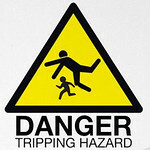 (See link here). Remember all profits go to support parkrun and it is better than having to plead with Andy Evans in the Akeman to include you in the results. It was my 100th Park Run which I semi-deliberately made sure fell on the 25th December. 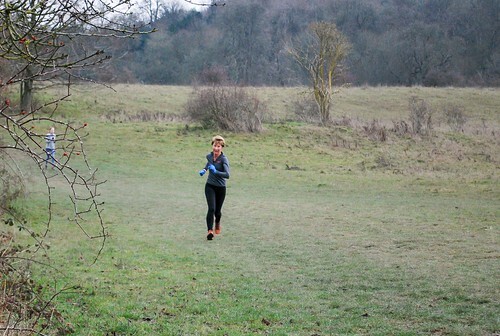 Carol (long suffering wife) and the kids are non-runners (despite my coaxing) so they do not understand the joy of running in the fresh air of Tring Park. It has been a long journey since the first one I did. Since I started, I have knocked nearly six minutes from my PB in 2016 to my PB in 2018 and lost two and half stone in weight. Chris Nicholls: 100 parkruns complete (99 at Tring), volunteered 52 times, achieved 27 PBS! Brilliant stuff, well done Chris and thank you. Also, I love Tring Park area. 2017 was a very bad year for me and one of the things that kept my mind off things was to run around the local wood lands and parks that we have the privilege to have on our doorstep. My one tip for parkrun is just finish. How ever bad you feel during it, not finishing will just make you feel worse. Even if you have to walk the final 1km to get the job done. After 8 weeks we still have 12 members (4 males and 8 females (including 3 junior females)) of our Year 5 100% club left. 13 runners have run at all 5 Tring Xmas parkruns however most Christmassy runner goes to George Humphries who has run 4 parkruns in total and each one has been a Tring Christmas parkrun. 100th time we have seen the surname Wood and 50th for Leff. Richard and Chris were the most seen names with 6 each. Katie was the most popular female name with 5..
Minutes 28 and 32 both broke their attendance records with 34 and 22 respectively. In fact the 34 in minute 28 is the busiest of any minute we have ever seen – smashing the previous record of 29 runners. Hopefully see you on the 29th. 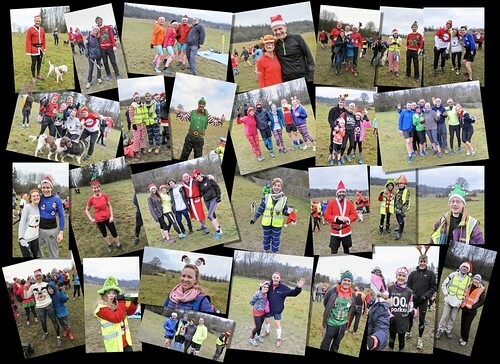 Get Christmas off to a fantastic and memorable start, join us for our Christmas Day parkrun. These are always popular and fun - so break out your Santa hat/costume (or anything festive) and join us! We expect a very good turnout, however the Hastoe Lane carpark will be closed and you should not park on Hastoe Lane itself. Also please avoid parking on the narrow residential streets close to the Park. Instead we ask that you arrive a minute early and park in the town, or walk, jog, bike........just avoid Hastoe lane, please. Click on the map below for more detail on parking on our Christmas Day parking arrangements. 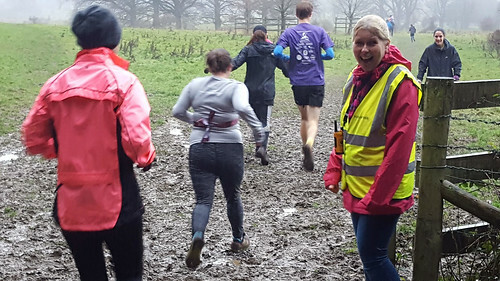 Christmas Day can be lonely for some people and we know that volunteering at parkrun can bring a real sense of cheer and community to those that might be on their own on Christmas morning. Feel free to invite anyone along - no experience is needed. Even just having a chat on the finish line is OK.
Volunteering on Christmas and New Year is always especially rewarding (and often the easier option!) get in touch with us by email at tringhelpers@parkrun.com. Wishing you all the very best for the festive season. 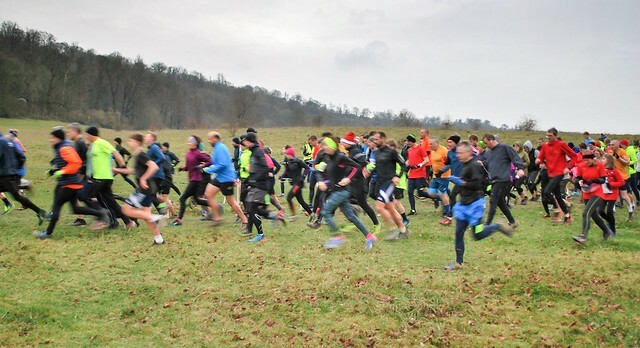 Tring parkrun 225 – It’s beginning to feel a lot like…. The elf on the shelf has decided that Tring parkrun has been very, very good this year and rewarded us with an early Christmas present in the form of the equally lovely Stuart Page, who joined our small group of Run Directors. What do Run Directors (RDs) do? 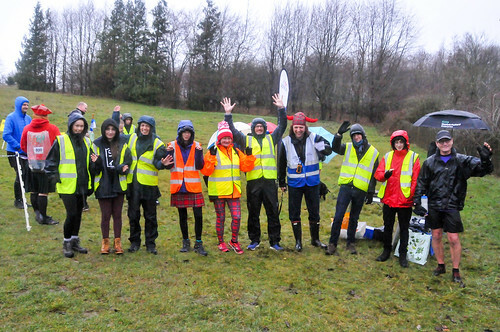 Mainly they are there as a point of contact, to help all of the other volunteers and to help ensure that everyone has a safe and enjoyable parkrun. 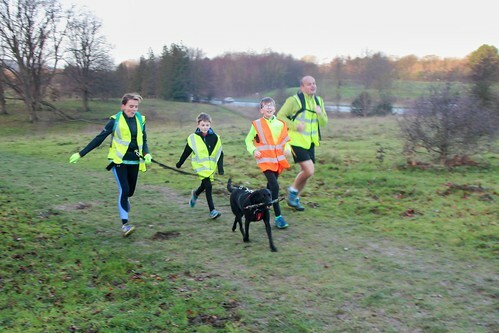 It's one of many "parkrun's little helper" roles, which might be worth remembering when it's time to write your New Year resolutions. Just saying! This week we have a special guest run report contribution from visitor Mark Pinney. Check out his great video below too. 'Twas the last parkrun before Christmas and all through the woods, we did the 5k in our jackets and hoods! As always around this time of year, it was great to see so many of you in festive hats and outfits (I was the one being carried on the back of a snowman! ), but there are still some of you who are more parkrun bonkers than that, by turning up in t-shirts and shorts! Some of you may have noticed me with a GoPro on my head as I like to video all of my parkruns and put them on YouTube for other parkrunners, so please have a look and see if you can spot yourself. Some photos of the volunteers can be seen at the end of the fast version. Click on the image below to play the video (or go and see it on YouTube). Marks's great video of Tring's Winter Course (this is the fast version). look out for Stuart/Andy's "mike drop" at the start (!! ), and watch Cow Pat Ally claiming a victim at roughly 8 mins! This week we had 226 brave runners, joggers and walkers. 13 "unkowns" (don't forget your barcode next week), 86 Females and 127 Males. First 3 Males to finish were James BAILEY in a great new PB time of 19:55, James DAVIS in 20:38 and Roland KEMP in 20:50. First 3 Female finishers were Sally NASH in 22:34, Scarlett WAGER-LEIGH in 23:12 and Francesca RYDE in 23:28. 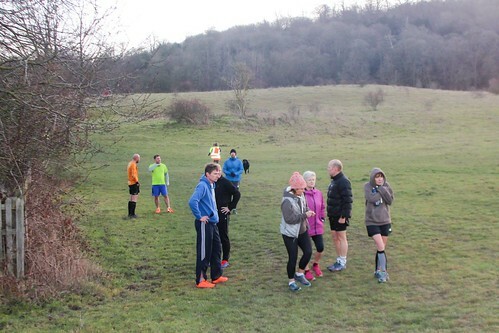 There were 15 parkrunners who were new to Tring of whom 3 were doing their first ever parkrun, and an amazing 26 PBs. So well done to everyone and we hope to see you back next week. 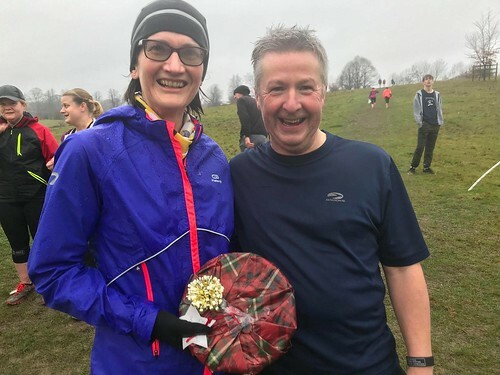 The "most runniest runner" was Paul MYATT on 202 parkruns, but there were 33 other members of the 100 Club, 44 members of the 50 Club and 19 members of the 10 Club present. Official milestone achieved today were Jennifer JENKINS who joined the 50 Club and Joshua HARRISON who joined the 10 Club. 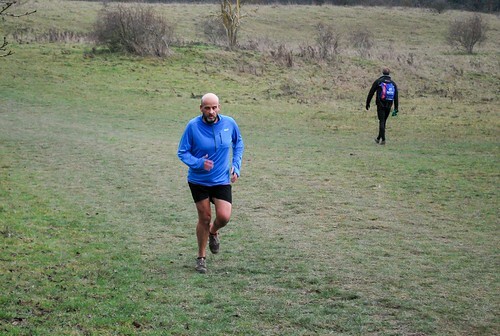 The person who has run at Tring more often than anyone else is Paul MYATT who has run here 190 times out of a possible 225. Well done Paul, that's commitment!! 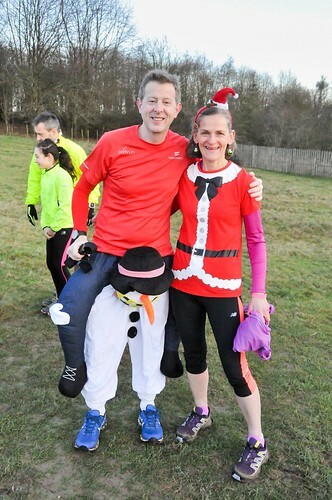 Great to see so many festive costumes already - bodes well for our Christmas Day parkrun. On the left is Mark Pinney who also kindly wrote this week's guest run report. Thanks Mark. We now have two excellent parkrun podcasts available each week. "Free Weekly Timed" is the offical parkrun podcast with Vassos Alexander and Louise Ayling. We also have "With Me Now" with Danny Norman and Nicola Forwood which is an independent parkrun-based podcast (some of you may remember Danny and Nicola from the much loved "The parkrun Show"). I thoroughly recommend them both. Now and then we award recognition to parkrunners who quite unwittingly (or perhaps through genius that we can't fathom) finish with remarkable times. This week we have a tie for outright winner between our very own Paul McCormack with a time of "two, three, four, five" (23:45) and first time visitor Kathryn Lloyd with a nicely descending "three, two, one, zero" (we have lift off). Respect!! A close runner up was Mark Pinney himself with a very symmetrical and pleasing 33:33! We like!! And the efforts to test the timekeepers made by juniors Cameron Wilson, Thomas Hanson and Edward Foxwell-Moss should be recognised too. They crossed the line together and all registered a time of 29:32. What also got my attention was the avalanche of milestone runs that might well land on Christmas Day itself. Four runners completed their 49th parkrun (Edward Margetts, Debbie Brown, Samantha Hollier and Lee Robinson) and two (Elaine and Holly Bunn) their 99th! Our largest number of parkrunners for a month set off down towards "Cow Pat Alley"
After 8 weeks we still have 16 (including 4 juniors) members of our Year 5 100% club left. Dedication! Len van de Linde becomes our 74th person to run 74 times at Tring - clearly a stat that they like in this family as wife Katie was the 35th to do 35, 38th for 38 and 40th for 40. 3 PBs in 3 weeks for Rob and Eddy Haddock, 2 in 2 for Shane Cheung, Nick Wake, Mark Tikaram, Bobby Donnelly and Steve Gould. Great work by all. Was Katie feeling it cold this morning or, as several have suggested, clutching onto a bottle of festive gin? You decide! Tring Park, 9am, December 15th - it definitely felt like winter. 168 brave souls (our lowest turnout since March! )faced off to the elements supported by our well wrapped team of helpers who made the morning happen. So a special thanks to Richard and Robert ALCOCK, Andrew BOOTH, Pauline BROWN, Alyssa CLARK, Jacob CLARK, Eloise CLARK, Andrew CLARK, Annemarie DE BOOM, Ken DOUGLAS, Samuel FRYER, Edward HOPPER, Nika JACKSON-MOORE, Frances LEFF, Isobel MONKS, Richard MURPHY, Clare MURPHY, Thomas PAGE, Stuart PAGE, Helen PAGE, Ciara POWELL, Andrew POWELL, Matty SINFIELD, and Oliver WEST. 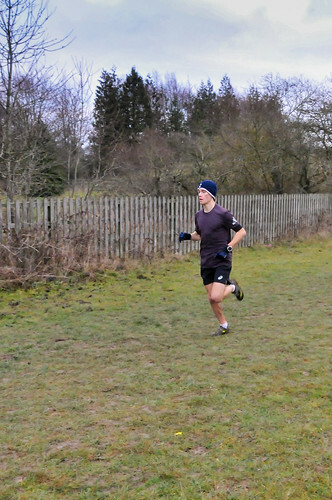 We had just one new parkrunner join us this week - Ben Young. We hope you enjoyed it ben and that we see you again soon. We had our first 2 sub-20 minute runners on our new Winter course, by local running legend Tom Sawyer. “Emily Harris earned her "Junior 10” milestone. Well done. Congratulations on reaching the “50 milestone” to Paul Crudge and Shelley Deverall-Roberts. Adman Swan reached the lofty heights of 100 parkruns“. 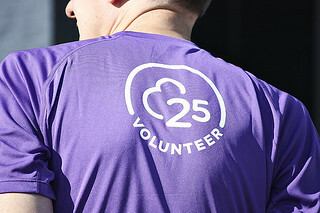 Stuart Page earned his purple volunteers T-shirt, having volunteered for the 25th volunteer. Stuart also put his hand up to join the dedicated team of Run Directors and will have his first stint next week. 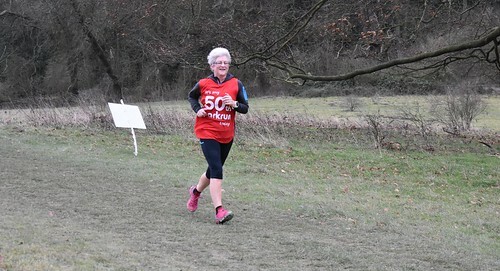 Carol Page became the 129th person to run 50 times at Tring. Meanwhile her husband Stuart completed his 25th volunteering stint (earning a coveted "purple parkrun T-shirt"). Emma Young is leading the way with the most PBs in year 5 – she has already recorded 6 – which isn’t bad given that we are only in week 7 and we are in muddy season! Many thanks to everyone - see you at Christmas! 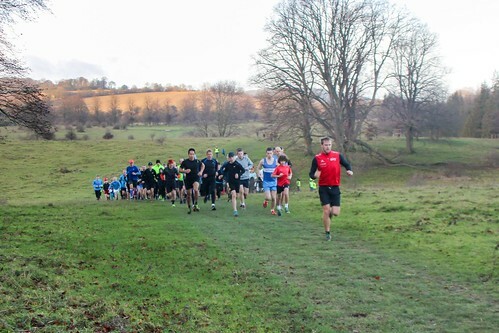 We bring you highlights from the last two parkruns. Busy, busy!! It's hard to believe that our next parkrun is the second last before Christmas. What happened to 2018 and where is the time going....? ....it's been going so fast that we've decided to bring you a "two for one" special to make catching up easy. Find out all about our annual kilted parkrun run on our brand new "winter route" on Dec 1st. Join us in celebrating fantastic milestones from our 223rd parkrun on Dec 8th. 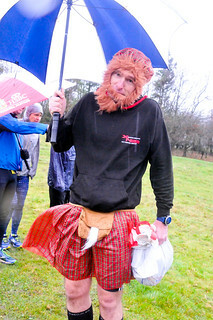 Our new route, the kilted run - and rain, lot's of rain! In the week leading up to our 222nd parkrun it rained. It really rained!! The path up from "Gate 1" was fast resembling a scene from Curse of the Swamp Creature; not ideal for an area designated a Site of Special Scientific Significance. Until we can figure out what best to do with that path the Woodland Trust asked if we'd bring forward a move we've been considering to a temporary Winter Route. Much frantic running around ensued to get ready on time - throwing Wes Ball (Run Director for that week) into the thick of things. Wes didn't need more rain or the McParkrun contingent complicating things - he got both!! On the other hand the rain kept many away and the numbers left to "test" our new route were manageable. They were down almost 100 on just two weeks previously, and that number might have been higher still had it not been for groups visiting for the kilted parkrun. We were 169 runners, with 20 visitors and NO first time parkrunners (I don't think that has happened before but I will defer to our in-house statistician). 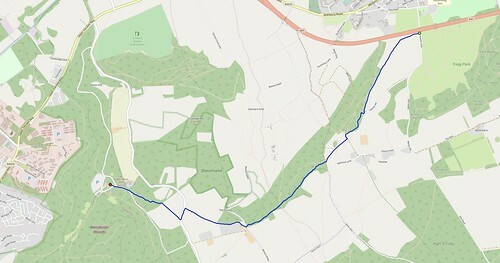 We were keen that the new course compare, time-wise, well with the normal route. There were only 11 PBs and even allowing for conditions that feels about right. Interestingly it was also our 1st run without any sub-20min finishers since July! It may be our Winter Route but that doesn't mean that you escape the mud! We still have one tricky section - and we'll keep an eye on that in the weeks ahead. On the milestone front - congratulations to visitors Rob and Jayne Dobbs from Harpenden Arrows, they reached 50 runs and earn a red T-shirt. Katie Haines and Steve McKee (also from Harpenden Arrows) both reached the lofty heights of 150. I mentioned PB's earlier, Simon Cobby was the only person to record a PB at both #221 and #222 although Rachael Macrae recorded her 4PB from her last 4 visits to Tring - both impressive stats. Well done to Alan Walker with a very impressive 12:39 improvement for his 2nd parkrun! A special shout out for Steve McKee, with the Harpenden Arrows, who ran his 150th parkrun. He brought a gift to give the 150th runner to cross the line, who happened to be Jenny Cooke visiting us as part of a group of 9 from Abingdon. What a great thing to do - brilliant parkrun spirit. Our single most impressive stat of the week, however, goes to Adam Woodhams who completed our 222nd parkrun with a time of 22:22. I'm in awe! Now if it had been his 222nd parkrun we would have strongly advised buying a lottery ticket! Just a few of the fantastic and friendly group visiting from Harpenden Arrows. BRILLIANT effort with the kilts and tartan (thank you) and also several notable milestones too. Abingdon AC smashed their previous club record of 2 visits with a group of 7, making them 5th most seen club in our new year after 5 weeks of our year 5. There were also 7 runners from Harpenden Arrows Running Club and they’re the 3rd most seen in this new year. Just two great examples of the effort so many went to for the kilted parkrun. Thank you Kevin and Len. Kevin's efforts earned him a packet of sacred Tunnock's Caramel Wafer Biscuits!! So that's it for week 222. 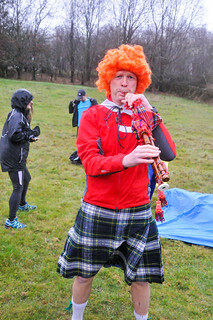 After ludicrous rain, kilted shenanigans and bedding in a new winter route - Tring parkrun 223 seemed "normal". Good! A chance to catch up with friends, enjoy the park and all that other marvellous parkrun stuff. Sadly we didn't have a dedicated photographer this week and so Run Director Richard Murphy had to "double hat"....if you fancy giving it a go, just let us know at tringhelpers@parkrun.com or say hello to the Run Director on Saturday morning. You don't need fancy kit - often our pics are taken on a phone - and we can edit them and upload them if you need us to also. This week 195 people ran, jogged and walked the course, of whom 16 were first timers and 22 recorded new Personal Bests. Paul became the first person starting at Tring parkrun to reach 200 parkruns. Dedication! We had a couple of notable milestones this week. 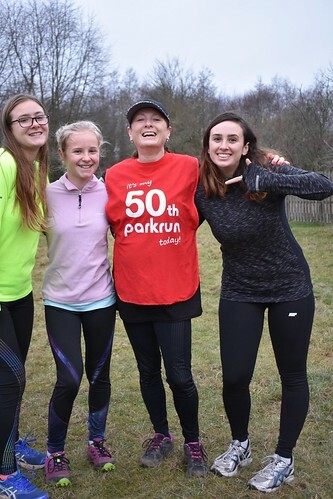 First of all Mary Ward reached her 50th parkrun and marked the occasion by being the fastest female finisher on the day. Congratulations. On the PB front Alan Walker made it 2 PBs in 2 weeks and and James Applebee managed his 3rd PB in his last 3 appearances at Tring. And of those who have run 5+ times at Tring the biggest improvements were Ben Baker (2:26), George Budd (1:38), James Applebee (0:43) and Louise Quinn (0:31). Great work. And finally since we started just over 4 years ago 6,596 participants have completed 38,989 parkruns covering a total distance of 194,945 km, including 6,677 new Personal Bests. A total of 555 individuals have volunteered 4,762 times. 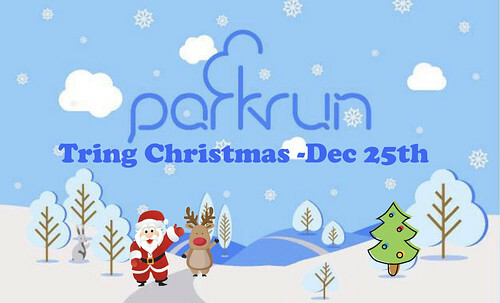 Below you can find details on both our Christmas Day parkrun and also our New Year Day parkrun. These have been really popular in previous years and we're delighted to do them again this year. Once again we'll be arranging an extra bonus parkrun (what better present could you get!!?) on Christmas Day. These have always been really great fun and get Christmas Day off to a fantastic start. Although dressing "Christmasy" or festive isn't mandatory... why wouldn't you??? Our special Christmas present to you - another parkrun. Click above to go to the event page. IMPORTANT: We expect a very good turnout. However the Hastoe Lane carpark will be closed and you should NOT park on Hastoe Lane itself. Also please avoid parking on the narrow residential streets close to the Park. Please arrive early and park in the town, or walk, jog, bike........just avoid Hastoe lane, please. Click on the map below for more info on parking on Christmas Day. Click on the map above to see a bigger version. 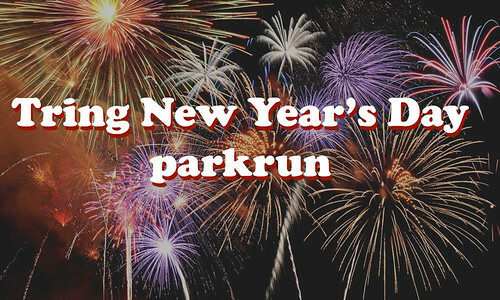 Get your New Year resolutions off to a fantastic start by joining us for an extra bonus New Year Day parkrun. These are always popular and this year we start at 9:00, so if you are very keen "do the double" and fit in another parkrun later that morning, the only day of the year you have this opportunity. A brilliant opportunity to get your New Year resolutions off to a flying start. Click above to go to the event page. We're looking forward to seeing everyone on these great extra parkrun days. Volunteering on these days is always especially rewarding (and often the easier option!) - let us know if you can help on either of these days by emailing us at tringhelpers@parkrun.com.